The average HOn3 rolling stock roster features a sea of nominally 30-foot, boxcar red equipment, and this new reefer from Blackstone provides a much-needed bit of color and variety. Long popular with modelers, the short reefer is a welcome addition to the Blackstone line. 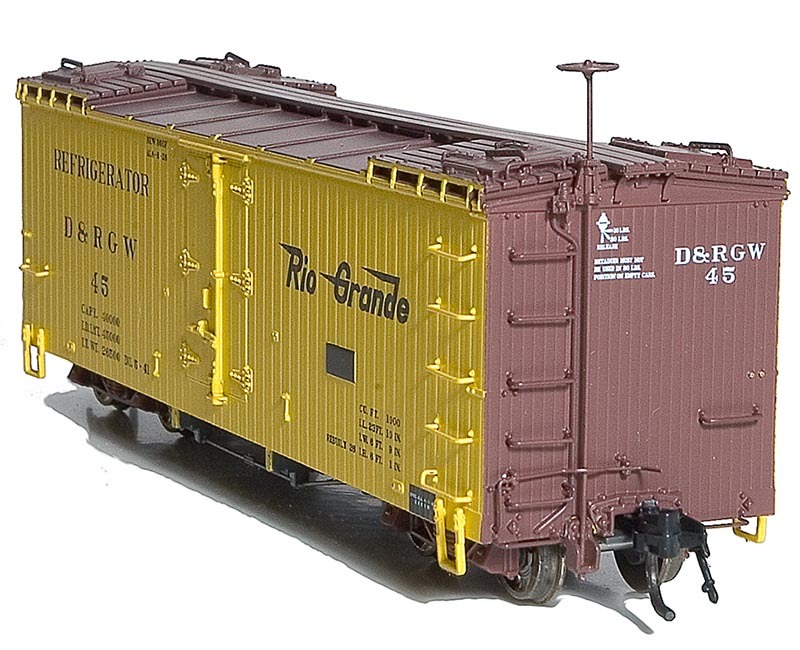 Blackstone has introduced the latest in their line of true-to-prototype HO narrow gauge rolling stock; the Denver & Rio Grande Western 30-foot “Short” reefer. A perennially popular prototype for narrow gauge modelers, this new car provides both variety and a bit of color to freight train consists. 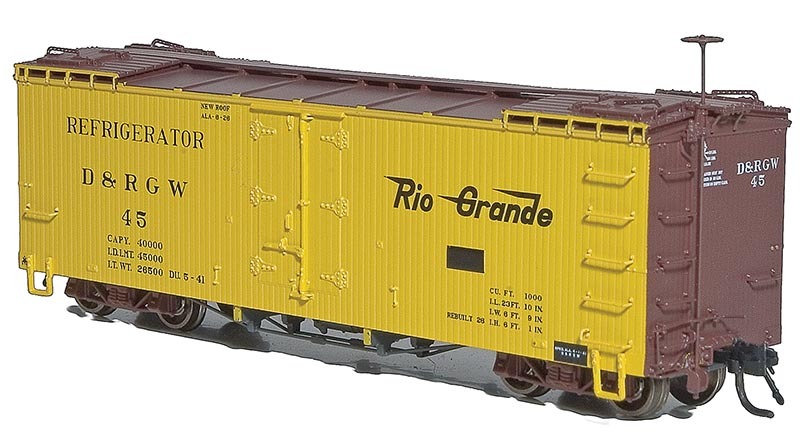 The Rio Grande got into the narrow gauge railroad business in 1871 with the usual mix of passenger cars, boxcars and flats, but quickly found the need to augment the roster with specially rolling stock like ventilated boxcars and refrigerator cars. This particular series of cars joined the roster in 1908 as replacements for earlier 1881-built cars. Designated Class 4r, the D&RG built 50 of these new cars in their shops in August of 1908. Numbered 32 to 81, these cars weighed 26,400 and had a 20-ton capacity with a volume of 1,031 cubic feet. The cars were 30 foot with truss-rodded wood frames and car bodies per standard turn-of-the-century car building practices. One item that gave them a bit of flair is that the queen posts and needle beams were tilted at a slight angle towards the trucks. The cars rode on American Car and Foundry 4’-8” wheelbase archbar trucks. Most of the D&RG narrow gauge cars rode on trucks with outside hung brakes but these trucks featured inside hung brake shoes. The thinking was that water from the melting ice in the bunkers would drip on outside hung brakes and considerably lessen their stopping power, especially in the winter as the water froze. The cars were dispatched all over the narrow gauge system, and faithfully piled up the train-miles for the next twenty years. The D&RG reorganized as the Denver & Rio Grande Western in 1920, and began to upgrade and modernize the railroad. This included rebuilding the bulk of the 1900-era narrow gauge freight cars. “Rebuild” is a bit of a misnomer. The tax laws at this time gave preference to a rebuilt asset when compared to buying a new car from the car builder, but make no mistake, cars going through this program emerged as new cars. The frames were built new, as were many aspects of the car body, the trucks renewed and the air brake system rebuilt and upgraded, in addition to some of the ironwork being replaced. When it came time for the Class 4r reefers to go through the process in June of 1926, 40 out of the 50 cars in the fleet were rebuilt. No. 79 had been wrecked in 1923 and Nos. 44, 58, 61, 62, 66, 71, 75, 80 and 81were retired in ’26. The construction of the Class 5r 50’ “long” reefers, Nos. 150-169, in 1924 and 1926 made those cars surplus and unneeded. The remaining cars received the Murphy sheet metal roofs, truck and ice bunker work; general repairs as needed and the needle beams were reconfigured to run at 90 degrees to the frame as seen on the other rebuilt cars like the boxcars and gons. Or at least that is what some rail historians have reported. But in examining the D&RGW engineering drawings for the rebuilds, they clearly show the needle beam and queenpost angling 6 degrees towards the trucks as was seen on the original cars. The folio drawings also show this feature, although folio drawings are not always the most accurate source of car configuration. The photographic evidence also suggests at least some of the cars featured the angled needle beams. At the same time, there is ample evidence that some, if not most of the cars were rebuilt with the standard needle beam/queenpost configuration. In the end, we’ll never know 100% because while numerous car bodies still exist, as the railroad scrapped the cars, they pulled everything below the frame beams off, so no definitive way to prove the configuration, one way or another. As anyone in the building trades knows, the plans don’t always match up with how the builders finish, so I suspect that some of the early cars were built with angled beams, and somewhere along the line the car foreman thought “we’ve built hundreds of 30’ cars with the needle beams and queen posts straight up and down, why are we going to the extra work on these?” and made a running change. The cars continued to serve the railroad for the next 20 years and then began to leave the roster: Nos 32 and 33 were sold in 1942; No. 37 retired at the end of 1948; and Nos 35, 38, 42, 50, 52, 59, 63-64, 70, 73 and 80 (likely a book recording error) in 1951. 1952 saw Nos 49, 51, 56, 60 and 76 leave the roster, followed by 47 and 69 in 1953. A fire destroyed No. 40 in 1953. By the start of 1957, traffic had diminished to the point that cars 34, 36, 39, 43, 46, 54, 55, 72 and 74 were not needed and retired, followed by No. 45 at the end of the year. The last two cars in the class, Nos 48 and 68 lasted until June of 1958. That should have been the end of the story, but it is quite amazing how many of the almost 100 year old car bodies survived scrapping and the railroad’s demise. Nine are confirmed as still in existence, including No. 45 at the Colorado Railroad Museum (currently in rough shape and awaiting restoration) and No. 55, which has been restored by the Friends of the Cumbres & Toltec in Chama, N.M., to full operating condition. Of note is the recent discovery and purchase of Nos 39 and 54 by the Durango Railroad Historical Society, the same folks who restored D&RGW No. 315 to operation. The two reefer bodies had been hidden away in a lumber shed in the San Luis valley in Colorado and had intact original paint and lettering on one side of the cars. No. 39 is well on its was to full operational restoration, using some metal parts from No. 54 and components from the wreck of No. 79 near the Ames Slide on the Rio Grande Southern. No. 54’s body will provide much needed storage in the Silverton enginehouse. Blackstone Models’ new 30’ D&RGW short reefer is the latest release in their extensive line of HOn3 rolling stock. Blackstone has earned a reputation as a builder of extremely accurate models that also operate well on layouts and this new car is no exception. In fact, access to prototype reefer No. 39 being restored less than 2 miles from Blackstone’s offices in Durango has yielded an exceptionally accurate model with unparalleled fidelity in paint and lettering. The model consists of plastic injection-molded body and details, a cast metal underframe, free-standing details and wire grab irons. The car rides on new scale 4’-8” archbar trucks with engineering plastic sideframes and bolsters and metal wheels. These trucks demonstrate the same free-rolling characteristics of the 3’-7” trucks that most of the previous offerings from Blackstone ride on. Because the sideframe is longer, the wheelsets can pop out in shipping or handling. If the truck doesn’t roll freely, simply reseat the wheelset in the journal, and it will glide along the tracks. The models are equipped with Kadee® No. 714 couplers. The car weighs in at 1.7 oz. This is consistent with the weight of other 30’ Blackstone cars. Dimensionally, this model agrees with published drawings, including plans in Slim Gauge Cars-Second Edition (available from White River Productions) and the D&RGW engineering and folio drawings. The model also duplicates the distinctive coupler striker plates (found only on the 30’ reefers) and the detail of the door hardware is nothing short of astounding. Inspection with a jeweler’s loupe revealed all the bolts, hinges, latches and door hooks found on the prototype; all rendered in crisp relief from the car siding. That same detail is evident on the ice hatches, including the holes molded through the straps that hold the hatches open. The underframe has the needle beams in the common non-angled configuration, which is consistent with the photos for the car numbers offered. Sound-equipped locomotives have become well accepted, if not the norm in the last few years, but the train trailing it also makes noise. Blackstone’s parent company Soundtraxx addressed that with the introduction of their Tsunami SoundCar Digital Sound Decoder. This decoder adds train sounds like wheel noise, flange squeal, rail clickety-clacks and coupler joining and uncoupling sounds to the consist, and this reefer is set up for drop in installation of this decoder. The 2015 HOn3 Annual contained an article with step-by-step instructions for installing the decoder in the new reefer. It should be noted that the underframe is slightly less detailed than previous Blackstone Models to accommodate the sound feature in that the piping on the airbrake cylinder has been simplified and the brake rigging is absent. This likely of no concern for a layout model, and even most photography, but if the modeler wished to upgrade the detail, this underframe and the underframe from the 3000 series boxcar cars are a direct swap. The average HOn3 rolling stock roster features a sea of nominally 30-foot, boxcar red equipment, and this new reefer from Blackstone provides a much-needed bit of color and variety. Long popular with modelers, the short reefer is a welcome addition to the Blackstone line. These cars were both long-lived and useful on the D&RGW, and also ran on the Rio Grande Southern, so you would be justified in adding several to your car fleet. List price for this fine model is $55.95.